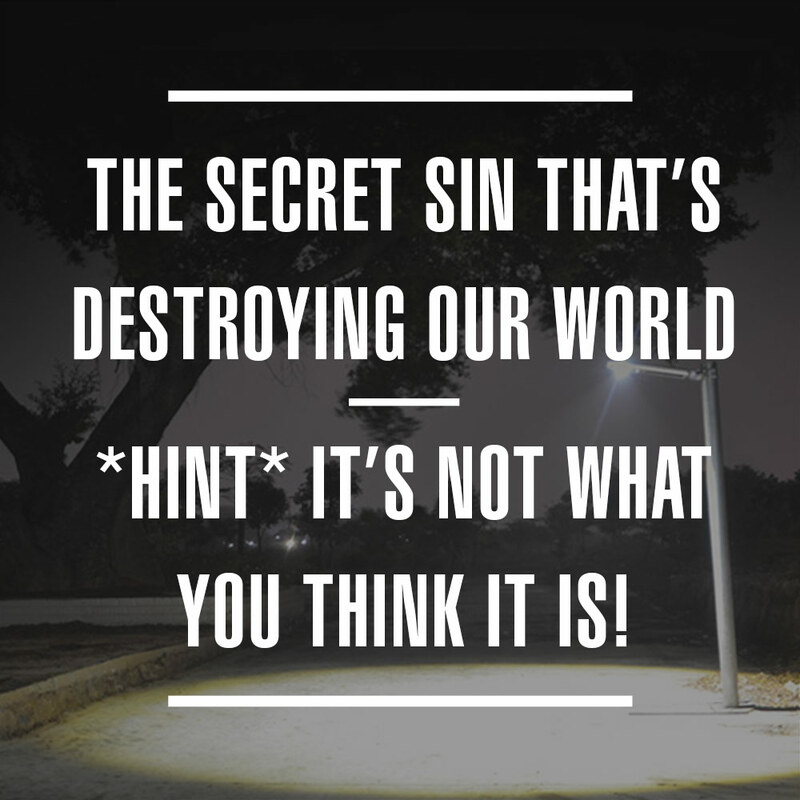 The Secret Sin That’s Destroying Our World. . . *HINT* It’s Not What You Think It Is! There are more teachers in this world than I can count, all of whom know more than me. There are countless men and women in this world, all of whom are stronger than me. “But God chose what is foolish in the world to shame the wise. God chose what is weak in this world to shame the strong.” 1 Corinthians 1:27. I write this letter openly admitting that I’ve spent the majority of my short life committing the secret sin that’s destroying our world. The trouble is, I’m no different from you. Because you’ve done the same. Only you don’t know it. Neither of us ever really think much of it. And that’s exactly what makes it so insidious, so deadly. You may not remember what I’m about to share with you, but you were there, 2,000 years ago. And I was there with you. I sat on his left. You on his right. A hammer in each of our hands. A nail in both of his. “My children,” he whispers as we hammer away. You want to know the sin that’s tearing our world apart? We commit it every time we consciously choose to ignore him. Jesus. God. Our Creator. The Lover of our souls. We ignore him. And in doing so, we tear the earth in two. The nail runs deeper, pooling blood from punctured flesh. A second scenario: We spend our time tending administrative details for the Easter Sunday service. It’s morning, and we feel our anxiety thicken as several children arrive late and unprepared for the mini play we’ve been practicing for two weeks. Still, somehow everything manages to work itself out, and after church we return home, go for a walk, and relax on the porch until the sun sets. A pause. I haven’t spent any time with God today. Even when I was at church, all I could think about was staying on task so that the play didn’t fall apart. We suppress a small surge of embarrassment, look to our left, and see our leather Bible sitting on the table beside us. It looks so attractive there, on the table. So perfectly placed that we don’t really want to disturb it. Besides, we’re a bit too comfortable to move ourselves. I think we need a new yearly ritual. Call it an “Easter Resolution.” That whenever we feel the nudge to spend time reveling in God’s presence, we promise to not ignore it. That no matter what we’re doing, we will set our hammer aside, and take a few moments to weave our fingers through his. Because God doesn’t care what you accomplish in his name, so long as you’re present with him. But heaven isn’t a place you go. It’s Someone whose arms you land in. And his are forced wide, tacked to a wooden beam. So let’s drop our tools and meet him there. Because eventually our bodies, like his, will come to an end. And all that will remain when our accomplishments are tested by fire are the things we did, and the time we spent, with our fingers woven through his. So let’s meet him there, and let the blood on his fingers mark our palms. Let’s let his tenderness break us. Change us. Heal us. Let’s answer him when he calls us. Our heart skips. What? Is he delirious? We just pounded iron through his flesh. And all of creation celebrates. 21 “Not everyone who says to me, ‘Lord, Lord,’ will enter the kingdom of heaven, but the one who does the will of my Father who is in heaven. 22 On that day many will say to me, ‘Lord, Lord, did we not prophesy in your name, and cast out demons in your name, and do many mighty works in your name?’ 23 And then will I declare to them, ‘I never knew you; depart from me, you workers of lawlessness.’” -Mathew 7:21-23, the words of Jesus himself. Yet Jesus promised the thief on the cross that the very same day he would be with Jesus in paradise. Let’s be the thief, and steal more time with Christ. Let’s not be the Pharisees, who were more concerned with truth, and right and wrong, and their own careers. Powerful stuff. Guilty as charged – thanx Brennan! I’m guessing you’ve been meditating a lot on Luke 10 as of late. Actually, I did think of that story of Mary and Martha from the end of Luke 10 as I wrote this. But this has been a topic I’ve been meditating on for the past couple years as I’ve spent more and more time in dedicated prayer and worship.